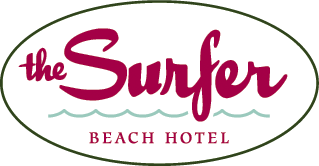 Welcome to the Surfer Beach Hotel: the premier, affordable, beach-side hotel in Pacific Beach, San Diego. The Pacific Ocean and sandy shores beckon from steps away from your front door. After a fresh dip in the ocean, the heated pool is just what you will need. Stroll to one of the dozens of restaurants and bars, walking distance to the hotel. Experience the outstanding service that our staff offer welcoming you to their home. With a variety of room types including Kings, Doubles and Junior Suites as well as a fully-accommodated two bedroom suite with kitchen, the Surfer is the perfect place for your next San Diego vacation.